ADManager Plus uses role-based permission management for efficient Active Directory administration. A role is a logical grouping of permissions based on common security administration tasks. Access Control Lists (ACLs) hold the permissions associated with Active Directory objects. Access Control Entries (ACEs) of an object determine the security principals and permissions associated with it. Creating security roles is much simpler than manipulating Access Control Lists (ACLs). The security roles can be easily and consistently delegated to more than one user, computer or a group. This minimizes errors and ensures uniformity in delegating security permissions besides making delegation a simple, trouble-free activity. This is not the case when delegation is attempted using the native AD tools or PowerShell. You can experience the ease with which this web-based Active Directory management tool allows secure delegation of even vital tasks like managing distribution and groups, granting remote user logon permissions, etc. using the free download of the 30-day trial version. 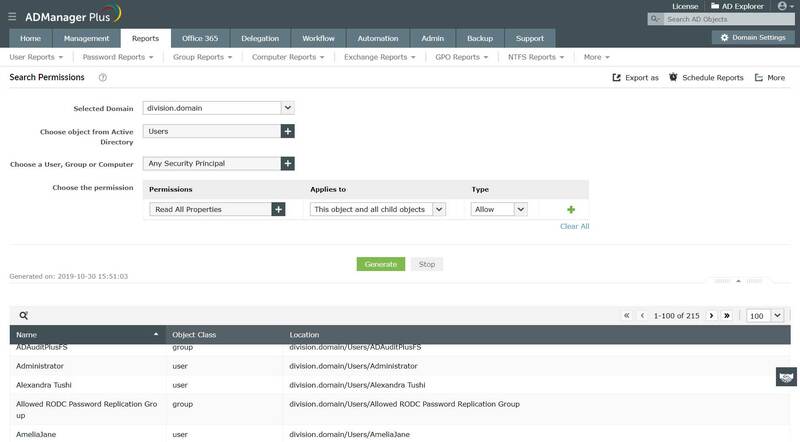 ADManager Plus provides you the ability to search the permissions granted to security principals, such as users, groups, and computers. It offers you the flexibility to include the active directory object, security principal, and the permissions in the search criteria.